The Zeiss 135mm f/2 Apo Sonnar T* ZE Lens is a great looking, extremely well-built lens that delivers stunning image quality. The better a lens performs, the easier it is to evaluate. When perfection is approached, there is far less time spent trying to figure out what the lens' defects are and when they matter. The Zeiss 135mm f/2 Apo Sonnar T* ZE Lens evaluation was one of the easiest I've ever done - this lens approaches perfection. Of course, having no features also speeds an evaluation process. To be more specific, the Zeiss 135 is a manual-focus-only lens, lacks image stabilization and lacks any other selectable-on-the-lens features. While its aperture is automatically controlled by the camera, the Zeiss 135 does little besides providing manual focusing and optical transmission. But it does those tasks extremely well. 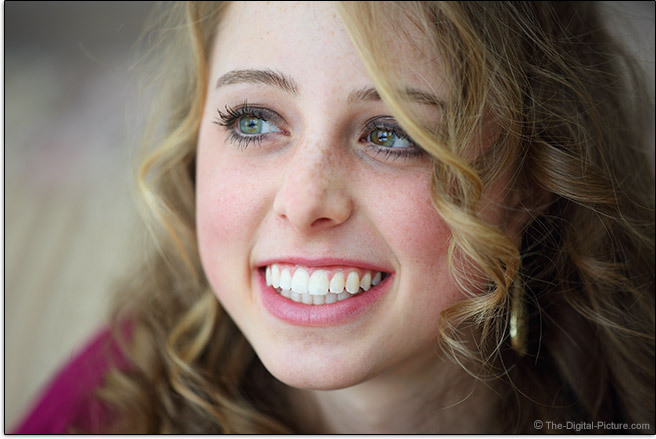 A manual focus prime lens in the 135mm focal length screams "portrait lens" to me. This focal length, on either a full frame or APS-C crop sensor format DSLR, provides a very pleasing portrait perspective even when used for tightly framed portraits at near minimum focus distances. Here is a head shot example. 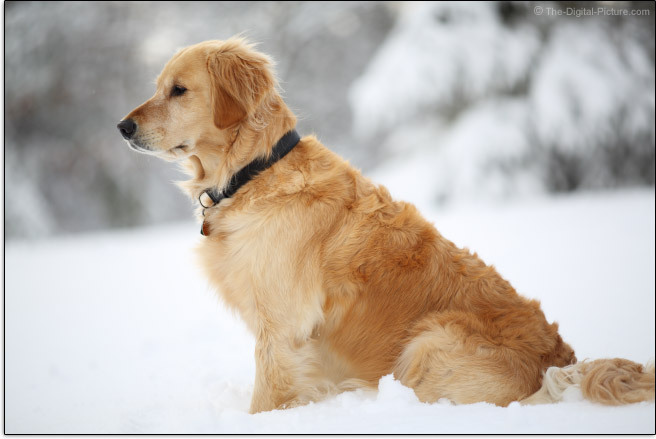 The wide f/2 aperture combined with the 135mm focal length used at a close focus distance will melt the background away. When used in this way, what is in the background matters much less than the predominant colors in the background (just as in this case). A 135mm lens can be used for many other purposes including product photography, landscape photography and sports photography. While the f/2 aperture is great for stopping sports and other action even in low light, the shallow f/2 DOF (Depth of Field) (with reasonably close subjects at least) means that all but the elite manual focusers are going to find most images rendered worthless due to focusing errors. I have to admit that I am challenged to manually focus close hand-held portraits with a stock DSLR focusing screen even when the subject is motionless. I'll show you why. 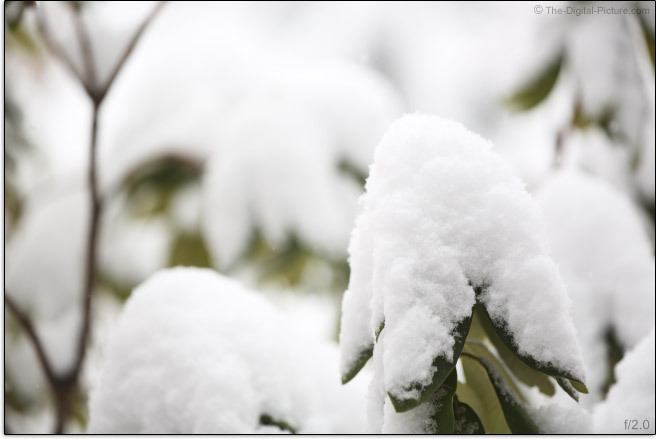 A wide aperture of course translates to narrow depth of field. The crops below are taken from the f/2 head shot portrait shown earlier in the review. When shooting with a DOF this shallow, the plane of sharp focus must be carefully planned out. In this case, I needed both of Brianna's eyes as sharp as possible. I also wanted her mouth to be in focus. Since the eyes and mouth are not on the same plane at this angle, a compromise was forced. Actually, at this DOF, a compromise needs to be made between keeping the eye lashes and eye balls in focus as both cannot be made absolutely sharp. I nailed this shot, but admit that many other attempts were not as successful. 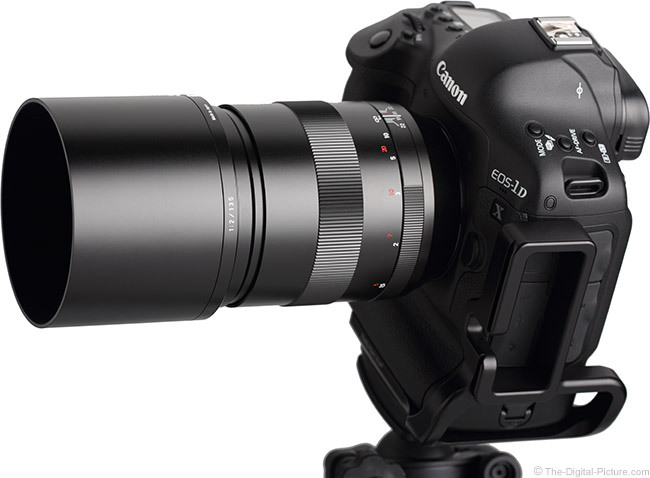 Looking at 100% crops begins to reveal the incredible image quality this lens delivers. I was handholding the Zeiss 135 mounted on a Canon EOS 5D Mark III camera with a modest 1/200 shutter speed. My shooting position was a bit awkward, so I was not as steady as I could have been. Still, the shot is sharp – within the plane of sharp focus. ISO was set at 320 and the aperture was, as indicated, f/2. 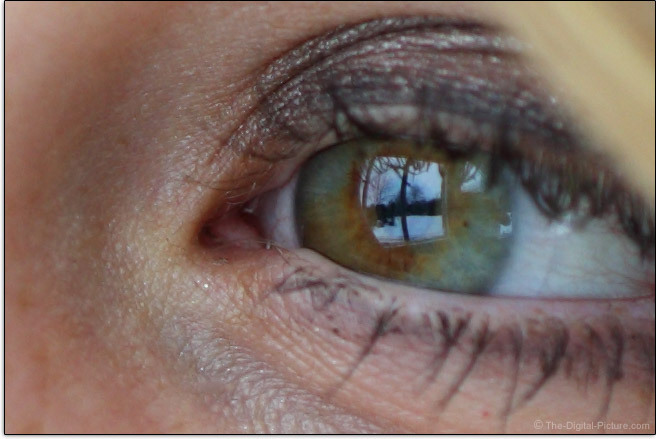 Light was from cloudy sky through large windows (notice the reflection in the left eye sample). The RAW image was processed in Canon DPP with a sharpness setting of only 1 (very low). Still, if you look at the absolute center of the plane of sharp focus (a very tiny area of depth), details are extremely sharp. Portraits can of course be of animals. Our golden retriever thinks she needs to be outside whenever one of us is out. But, I didn't want her tracking up the fresh snow. So, at my request, she sat and watched. Then I decided to make her the subject. Snow is a great light reflector; and especially with the shallow f/2 depth of field, the dog really popped against the mostly snow background. The dog's eyelashes are so sharp in the full resolution image that aliasing from over-sharpening begins to show at a DPP sharpness setting of "2". You better get a tissue and, if you are in public, rest your chin on your hand to avoid the embarrassment of being seen with your mouth wide open before opening the image quality results (ISO 12233 enhanced resolution chart sample crops) for this lens, because the contrast and resolution delivered by the Zeiss 135mm f/2 Apo Sonnar T* ZE Lens is jaw-dropping and drool-worthy. The results are simply stunning. At f/2, the Zeiss 135 is extremely sharp across an entire full frame image. To get sharper images is not a good reason to stop down from this this aperture. You will be challenged to see any sharpness difference aside from an increased DOF caused by a narrower aperture being selected. The contrast and resolution this lens delivers at a wide open f/2 aperture place it among an elite group of lenses. Very few lenses deliver image quality this good at their widest aperture and many lenses cannot match this performance even when stopped down. 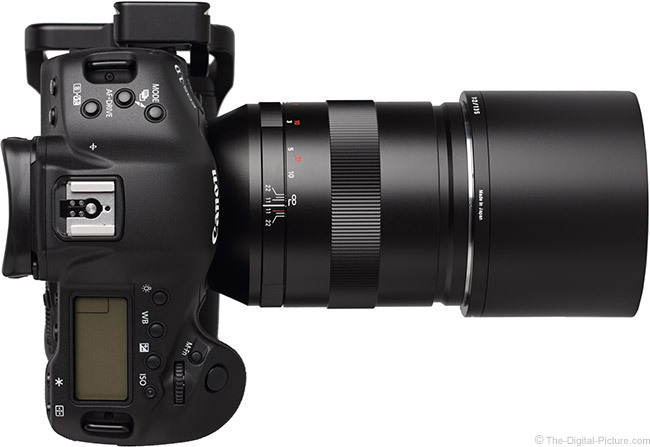 The current Canon and Nikon 135mm f/2 offerings cannot match this performance. That f/2 is the widest aperture currently available in a 135mm DSLR lens only increases the magnificence of this performance. Contrast and resolution are only the beginning of the Zeiss 135's high performing scores. Results in all of the tests performed are best-in-class. Distortion is not discernable. CA (Chromatic Aberration) is not discernable. Longer focal length lenses are much more prone to flaring when tested with the sun in the corner of the frame than their wide angle counterparts, but the Zeiss performs very well in this test. While some flare will show with the sun in the corner of the frame, the Zeiss 135 performs very favorably compared to the Canon 135 f/2. I have yet to see a lens that shows no full frame vignetting at its widest aperture, especially wide aperture lenses. The Zeiss 135 f/2 does not break this tradition, but it also performs reasonably well in this regard. Full frame users should notice about 2 stops of peripheral shading in image corners at f/2. The transition in brightness from the center of the frame to the corners is smooth. At f/2.8, shading decreases a noticeable amount to a not-typically-noticeable .8 stops and at f/4, our lab software can barely detect any unevenness. 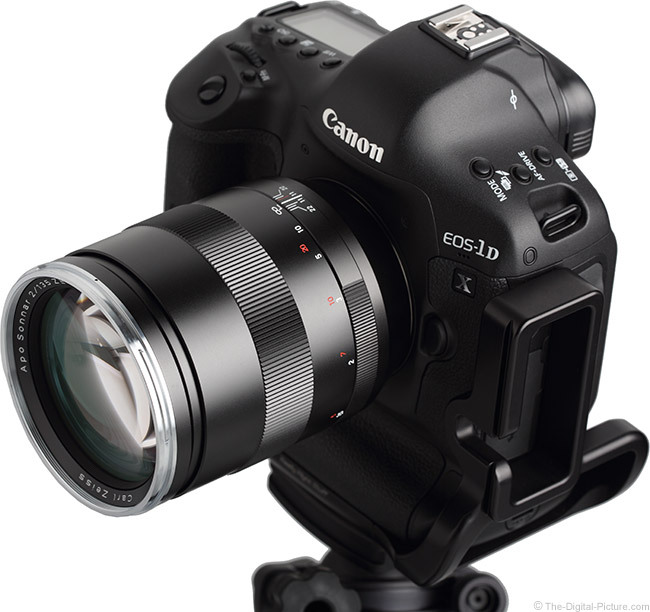 APS-C/1.6x FOVCF DSLR owners may not even notice the slight close-to-1-stop of corner shading at f/2. Clearly seen in the sample image below is that the Zeiss 135 has 9 aperture blades. These blades are apparently not rounded, or at least not rounded much as the edges of the out-of-focus specular highlights are nearly straight lines. There are some concentric bright rings leading into the out-of-focus specular highlights (normal), but the centers are very smooth. Again, this lens has the ability to create a LOT of blur. 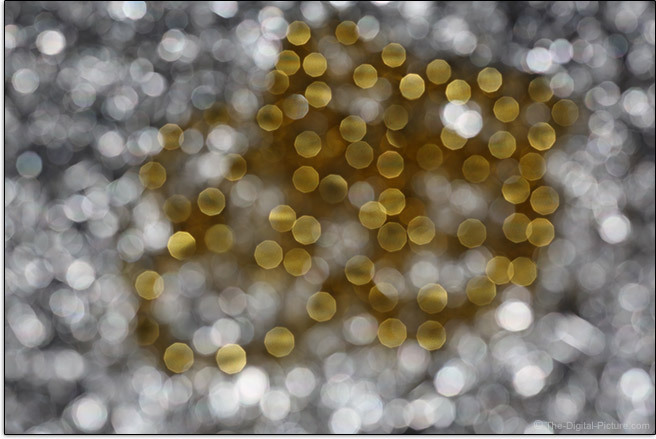 Expect to sometimes see a bit of bokeh CA in the out-of-focus areas. 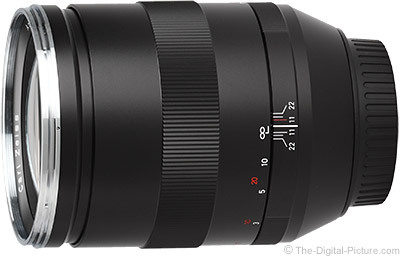 As already made clear, the Zeiss 135mm f/2 Apo Sonnar T* ZE Lens is a manual focus lens. So are all of the other Canon and Nikon-mount Zeiss lenses. Fortunately, Zeiss makes some of the finest manual focus systems available. With a huge 265° range of solid, very smooth, nicely-damped rotation, it is very easy to precisely fine tune the 135's focus setting. Of course, if you are changing focus distance from near minimum to near infinity, you have a lot of ring turning to do. As seen above, the Zeiss 135 extends with focusing, becoming longest at its minimum focus distance. Somewhat unusual is that the focus ring moves outward with this extension. 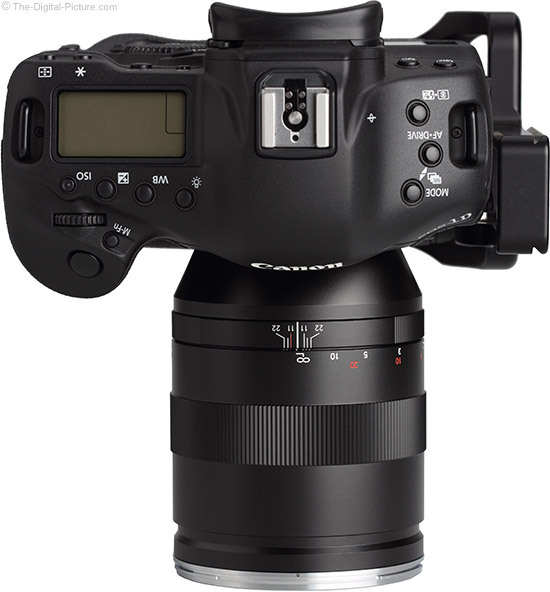 This setup is not my favorite design as the camera and lens become back-heavy when holding the extended focus ring. I prefer the ring to remain at the rearward balance point. 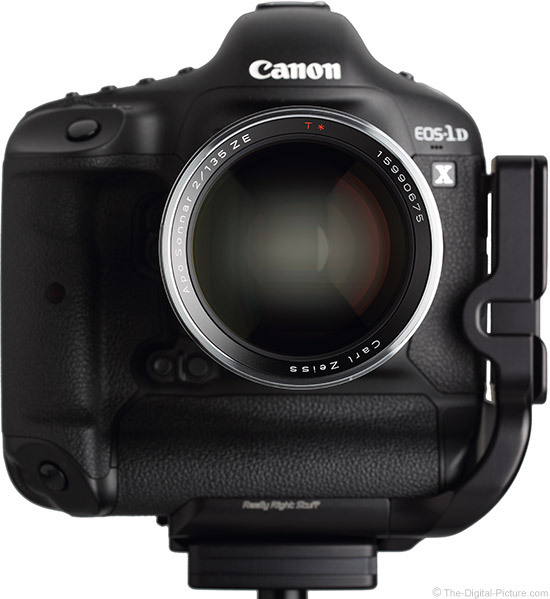 As seen on the extended lens above, depth of field marks are provided throughout range of barrel extension. These marks along with the focus distance markings are engraved into the lens barrel and focus ring. Focus distance settings are easily repeatable. Infinity is a hard stop with distant subjects being sharp just before this hard stop. Appreciated, especially by those using circular polarizer filters, is that the Zeiss 135 front element and filter threads do not rotate during focusing. Less appreciated is that subjects change size modestly during full extent focusing changes. The Zeiss 135mm f/2 Apo Sonnar T* ZE Lens is best-in-class for MFD/MM (Minimum Focusing Distance/Maximum Magnification) performance. The 0.25x MM spec beats most non-macro telephoto prime lenses. 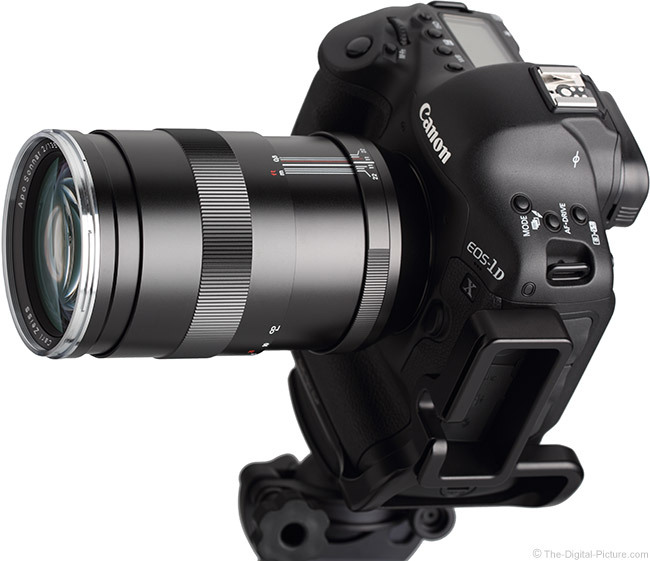 If head shots are on your list, this lens does not need an extension tube to make them happen for you. I tried mounting a Canon extender behind the Zeiss 135, but it does not physically fit. Zeiss does not currently offer extenders and the Canon variants are obviously not compatible. Other third part extends may be compatible, but I cannot attest to their quality. From a build quality perspective, few lenses compare to Zeiss lenses. And featuring an all-metal construction, this lens looks and feels as good as it performs. As mentioned before and now shown in comparison format above, this lens extends during focusing – by 1.11" (28.3mm). The focus ring is the only moving exterior part on this lens and it is solid with absolutely no play. Note that this is not a weather sealed lens. A perhaps not-so-favorable class-leading attribute of the Zeiss 135 is its weight. Zeiss lenses are highly regarded for their build quality, but they are not known for light weight. While this is not a heavy lens, it is the heaviest in its (albeit small) class. For many more comparisons, review the complete Zeiss 135mm f/2 Apo Sonnar T* ZE Lens Specifications using the site's Lens Spec tool. The weight of this lens has not bothered me in use. The extra weight can help stabilize the lens during focusing and when framing/capturing a picture. 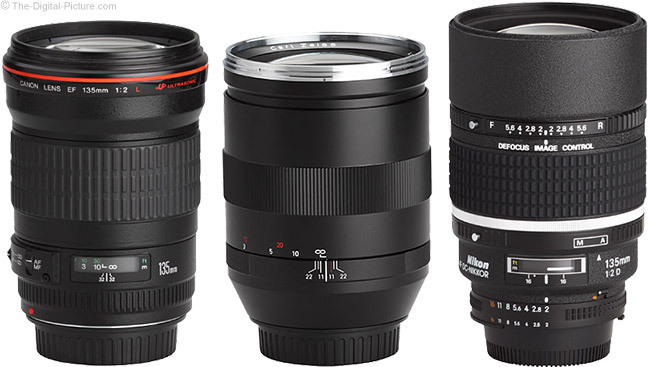 The size of this lens is similar to the Canon and Nikon variants. I consider this to be a medium-sized lens and enjoy working with lenses of this size. 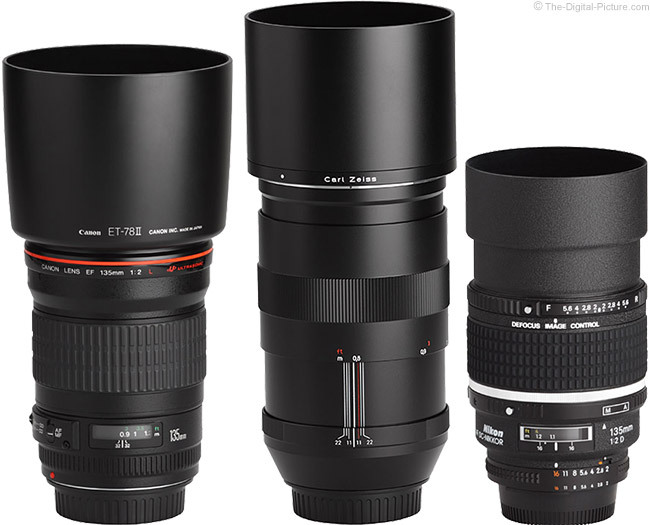 Here is a comparative view of the three 135mm lenses. The Nikon 135 design, though only introduced 1 year prior to the Canon 135, appears quite old in comparison. One (of two) significant advantage these lenses hold over the Zeiss 135 is autofocus. The Zeiss 135mm f/2 Apo Sonnar T* ZE Lens ships with a very protective metal lens hood. This is a narrow hood that consumes little additional space when installed in reverse orientation. 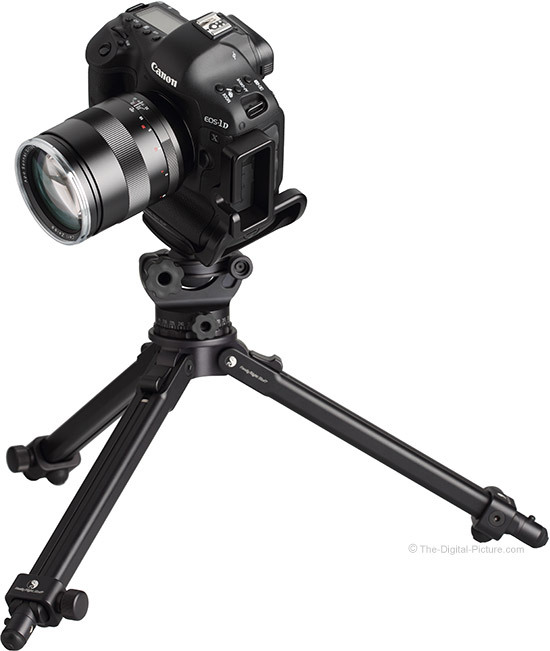 This keeps the lens compact during storage and transportation – allowing a smaller section of a case/backpack to be used. Of course, if you increase the density of Zeiss lenses in your case, the case is going to get quite heavy. I have first-hand experience with that issue. One cannot have too many Zeiss lenses; however, trying to carry all your of Zeiss lenses in a backpack for any length of time may lead to weight-induced regrets. Zeiss does not include a case with this lens (or any I've reviewed to date). The Zeiss 135 uses common but relatively large 77mm filters. The other significant advantage the Canon and Nikon 135mm lenses hold over the Zeiss 135mm lens is price. This is a premium grade lens and it comes with a high price tag – nearly twice as high as the Canon. 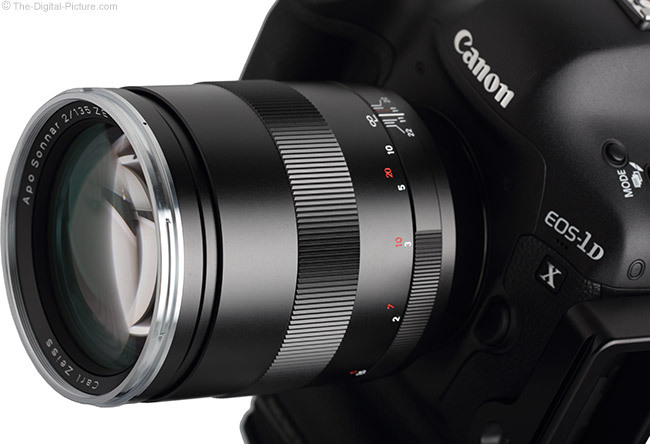 The Zeiss 135mm f/2 Apo Sonnar T* ZE Lens is available in Canon (reviewed) and Nikon mounts. I generally provide a warning about potential issues with third party lenses, but there is not as much risk with a manual focusing lens. Zeiss provides a limited 2-year warranty that extends to 3-years with registration. 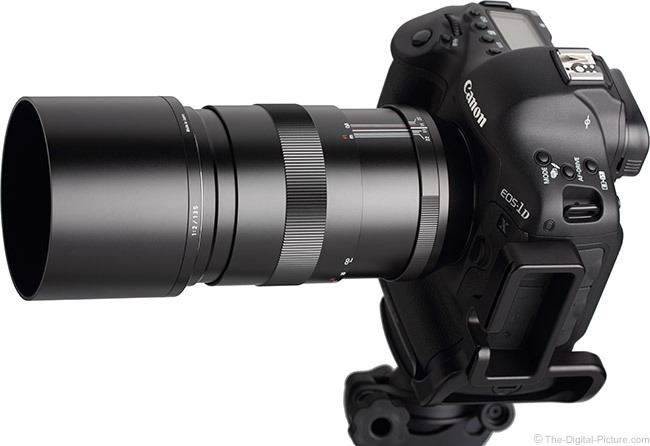 If this lens were an autofocus lens, I doubt that Zeiss could make them fast enough to keep up with the demand. If manual focusing is not an issue for you and if 135mm meets your focal length needs (and your budget affords this lens), I see no good reason to forgo this investment. Those that make this investment can expect the superbly-made, fun-to-use Zeiss 135mm f/2 Apo Sonnar T* ZE Lens to deliver stunning, unrivaled image quality in a lens that’s built to last a lifetime.